Two games into the current Stanley Cup final, the Black Hawks are in a good position to do something they haven’t done in 50 years--and something the Leafs haven’t done in more than 40. To appreciate what serious modern-day Black Hawk fans might be feeling--the anticipation about achieving something you’ve dreamed about for decades--you perhaps have to be a long-suffering Maple Leaf fan. A little history will help put things in perspective. As I mentioned in a post about a week ago, in the mid-to-later 1950s, the Black Hawks were an NHL weak-sister. They hadn’t won a Stanley Cup in ages, and had become a cellar-dwellar. Hockey fans of the ‘60s, ‘70s and ‘80s remember a raucus Chicago Stadium, where officials would announce the same crowd number every night of 16,666. But everyone knew there were actually 20,000+, some virtually hanging from the rafters. It was a tough place for opponents to play. Yet before that golden era, in the mid and late-1950s, such was the state of the Hawks that they became the dumping ground for NHL players from other teams. Specifically, players who had dared defy the league establishment, and had the nerve to speak openly, if in a limited way, about forming an “Association” of players. Not even a union, simply an “Association”. But perception was everything, and in the owners’ minds the efforts to start a “union” were akin to a mutiny- and those efforts really didn’t get off the ground because the majority of players were afraid. The result: a lot of guys who were the catalyst for the would-be players' association were traded to Chicago. Future Hall-of-Famer Ted Lindsay was just one of those affected. Lindsay retired before the Hawks won their Cup, but he helped re-shape the attitude in Chicago. The organization, under General Manager Tommy Ivan, also began to rebuild with youth in the late 1950s. They acquired Glenn Hall from the Red Wings, which gave them great goaltending for the next decade. 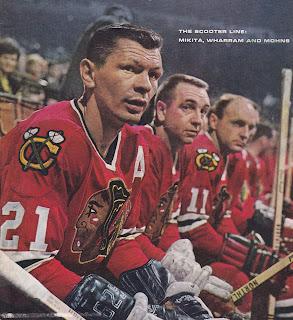 They brought up a swath of budding stars from their junior A team in St. Catharines--“Moose” Vasko, Pierre Pilote, Bobby Hull and Stan Mikita among them. That was a great core right there. Management was also smart enough to bring in some “winners” from Montreal, a franchise that knew a thing or two about developing a championship attitude. Ex-Habs included Eddie Litzenberger, Dollard St. Laurent and winger Ab McDonald (McDonald was part of the original “Scooter” line with Mikita and Kenny Wharram). Throw in ex-Leaf mainstay Tod Sloan, future Maple Leaf rearguard Al Arbour (who previously played with the Red Wings), tough guys Tex Evans and Reggie Fleming, another ex-Leaf in Erik Nesterenko, Bill Hay, and the Balfours--Earl, trained in the Montreal system, and Murray, who came up in the Toronto system - and Chicago was a quality team. Coached by the entertaining Rudy Pilous, they were looking to get to the ’61 finals--which would be their first ‘finals’ appearance since well before I was born in the early ‘50s. Playing against the 5-time defending champion Habs, they were the decided underdog--the young upstarts against the playoff-tested Canadiens. Now, the Habs were without Rocket Richard, who had retired the previous fall. But the truth was, Richard had not contributed greatly the previous two springs, for a variety of reasons, notably age and injuries. But they still had Jacques Plante and Doug Harvey, along with Tom Johnson, to bolster their back end. And of course, Beliveau, Geoffrion, Henri Richard, Dickie Moore, Gilles Tremblay and some outstanding grinders such as Claude Provost and Marcel Bonin along with youngsters like Ralph Backstrom, Donnie Marshall and Billy Hicke. After four games, the semi-final series was tied two games apiece. With Game 5 at the Forum, it was expected that Montreal would establish their dominance in the series. Instead, Glen Hall earned the first of two consecutive shutouts, 3-0. Three nights later, the Hawks and Hall duplicated their achievement, winning 3-0 again to wrap up the series in six games. The Habs and their fans were shocked. Their run of five Cups in succession was over. It took until 1965 for Montreal to get back to the finals, which for that franchise, in those days, was forever. The Hawks went on to beat the Red Wings in 6 games to win the Cup in 1961, something they haven’t won since. But they’re on the doorstep now. And they don’t even have to end a dynasty to meet their objective.